Recently held in New Delhi, the Rosatom Festival of Science for schoolchildren aimed at advancing Russian-Indian cooperation in education and social policies, as well as raising awareness about the peaceful uses of nuclear energy. New Delhi (Sputnik) — The Festival of Science organized by Russia's nuclear energy corporation Rosatom in New Delhi has received tremendous response from students. Sputnik spoke to research Rosatom scientist Daniil Gladkikh and science journalist Elia Kabanov who said they encountered a volley of questions from curious students about nuclear science and its applications for the benefit of humankind. Daniil and Elia visited different schools in New Delhi to talk to children about nuclear science and dispel common myths about its applications. 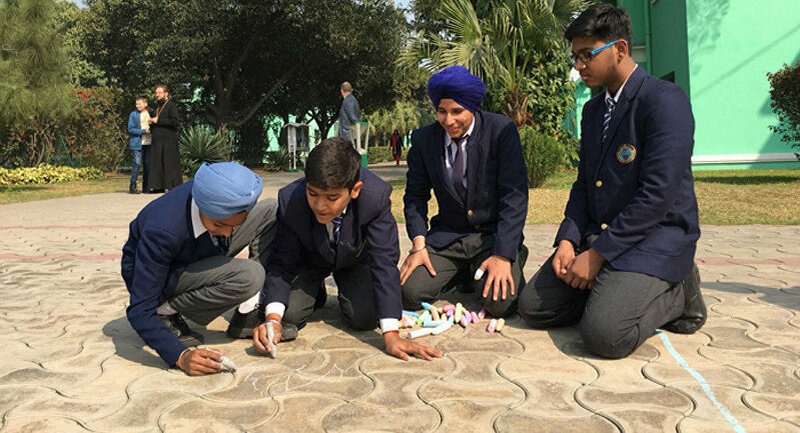 Sputnik: Tell us about your work with students in New Delhi schools? Elia Kabanov: The schools were nice to engage with us in talks which were educational not just for them but for us too. I can confidently say that children in India are smarter than kids of their age elsewhere. They are focused. Daniil Gladkikh: We found that children here are very enthusiastic and particular about their queries. They knew their facts very well and we were ready for tough questions as, so we weren't caught by surprise. Sputnik: The Festival of Science is about educating children and the importance of science. How will it help them with their careers in the long run? Elia Kabanov: We came here to give lectures and talk about how science is changing our lives and has the potential to make our lives better. One of the things we encountered was the idea among the kids that nuclear technology was for war and attacks. We told them about nuclear science and how it was mostly about peace. We spoke about nuclear medicine and nuclear technologies that make people's lives easier and help humanity in more than one way. We had a chance to talk to children about the plethora of career opportunities that exists in the field of science. We were happy to answer all the questions regarding that matter. Sputnik: What was the schools' response to being part of this festival? What was main message for the kids? Elia Kabanov: We received a warm welcome from the schools. The audience was comprised of students from different local schools. I'd like to reiterate that students in India are well prepared and responsive. In fact, their questions challenged us. In January last year, I was working with children in the Indian city of Chennai. Daniil Gladkikh: There were many students who wanted to pursue a career in medical science and it's quite interesting, as in this part of the world children have a great interest in science. It's good news for humankind because there are sharp and intelligent young minds, they have the ambition to take up research and be a scientist. We tried to convey to the kids that scientific community can be the best ambassadors for peace and international cooperation. No scientific research can happen in isolation. We need to collaborate and understand that every person can come up with something new. Even small projects can involve around a dozen countries — this is the kind of coming together we talk about when we speak of scientific collaboration and camaraderie. Sputnik: Tell us about Rosatom and its efforts in promoting nuclear science. Daniil Gladkikh: Rosatom is the nuclear energy corporation of Russia. One of its goals is to educate young people about nuclear science. Contrary to popular belief in India, Rosatom is mostly about nuclear science and nuclear medicine — not just about nuclear energy. Sputnik: In India there has traditionally been a bias against young girls in schools. In fact, a recent economic survey by the government of India has also raised concerns over the issue. Did you encounter any differences in treatment of girls and boys in Indian schools? Elia Kabanov: No, I must say the experience was different. It was mostly girls who asked the challenging questions. A girl from the Delhi Public School Dwarka asked me if science can solve the menace of water contamination, which affects so many lives in India and is a major cause of diseases. I told her about the available technologies and also the fact that Rosatom is working on the ground, as part of the Indian nuclear power project in Kundakulam (Tamil Nadu), helping to convert salt water to drinking water with the help of technology. The views and opinions expressed by Daniil Gladkikh and Elia Kabanov in this article are those of the speakers and do not necessarily reflect the position of Sputnik.